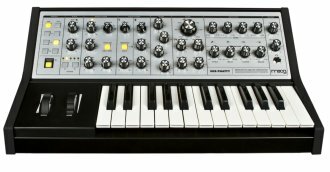 The Moog Sub Phatty has the soul and hands-on control of a vintage Moog synthesizer in an aggressive sound design machine. It has 25 keys, 31 knobs, and 13 switches that connect you directly to the analog heart of this powerful instrument. Its oscillators have been designed to perform with unmatched clarity, and accuracy in any environment with no warm-up time necessary. They are fat, punchy and loaded with harmonic content. A Multidrive circuit in the filter section totally transforms the sound of this analog synthesizer into a screaming beast. Create gritty attack, asymmetrical distortion, and saturated hard-clipping sounds that tear through the densest mix. The mixer section houses a powerful square wave sub oscillator designed to add depth, thickness, and side splitting bass to any sound. In addition to this, a specially voiced noise generator has been incorporated for sculpting hard hitting, all analog percussion sounds and other sound effects. 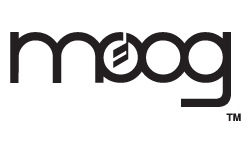 The Sub Phatty joins the Moog arsenal with a boldly unique voice. Its engaging and dynamic interface fuses a connection between man and machine that opens the door to unprecedented sonic exploration. Oscillator Calibration Range: 22Hz - 6.8KHz. Available until 11 PM (EST) today. Mention special code 208-KDSP when you call.